One of my favorite memories growing up as a young kid was hitting the road with my family on the weekends and camping in the beautiful green back forest of Oregon. That isn’t to say that it was all sunshine and bluebirds. There were some nights that were rather uncomfortable, and I longed for the comfort of my own bed. It would have been perfect if at the time we had a trailer with a nice set of bunk beds. Below in this post are the best travel trailers with bunk beds that I wish I had growing up. Many of the trailers selected are new for 2018. There are a decent amount of options for trailers with bunk beds, but our goal was to only select the highest quality trailers. I put in hours of research to select the ones that based on reviews, manufacture rating, and features could be considered the best options. I hope you like what I selected. Please send me a message with your feedback if you feel something should be added or removed from the list, and I will be sure to make the update. Colemen has been around for awhile now. They have had since the year 1900 to work out the logistics of their operations, and to understand the best way to fulfill their obligations to their customers. They have done pretty well. Overall, they have a good reputation for producing what are considered quality products that suit the entry or luxury class to which that particular RV is ascribed. As for the Lantern series, Dutchmen has remained consistent in their approach. Perusing the internet forums, you will find a relatively satisfied customer base. There is a lighter version of this series called LT Lantern. Click here, if your tow vehicle requires something a bit lighter. Looking through the floor plans, you will find a large selection of bunkhouse layouts. If their claims are true, Palomino offers the largest selection of bunkhouses in the industry. They have also made the claim that they have a “multitude” of standard features, and I have found that to be true as well (As you can see from the snippet above). As with almost every RV out there, the craftsmanship is more than questionable. Reports of screws falling out and glued areas needing regluing are fairly common. However, I’m not coming across reports of anything serious falling apart. I’m finding a lot of people happy with this line of campers. The more popular the brand, the more prolific the complaints. Browsing through the complaint sites, you will find many unhappy customers. However, according to polls and forums, Keystone is a decent manufacturer. According to one poll, 90% of the Keystone customer base would purchase a Keystone again which is a stunningly good percentage. This is a budget class of travel trailers, but it doesn’t act like it. When the compliments are much easier to find than the complains; you’ve probably got something good happening. At least, that’s the case in the RV world. floor plans are well-designed, I’m finding pretty consistent customer service, and good warranty response. Crossroads is one of the many subsidiaries of the Thor company collective. Thor started in 1980, and it has grown dramatically. The range of the RV quality varies, but the Crossroads Zinger has some pretty good feedback. As far as budget class travel trailers go, relatively speaking, these are solidly built with good quality control. Most warranty problems seem to come to reasonable resolutions. They have some lightweight models (Less than 5,000 Pounds), so the weaker tow vehicles have some options. Jayco trailers has been around for half a century, and like Thor, has built an empire. The SLX’s are one of many model lines, and one of its standout features is its lightweight floor plans. If you are interested in the lighter weight plans, you should be aware of the floors. Some floor plans have composite flooring and some have plywood. It has been noted that the Jayco’s composite flooring can develop softspots, and that the plywood floors don’t have that issue. Aside from the composite flooring, it has a good reputation. There are some expected durability issues and those, of course, become bigger issues as “lightweight” becomes the highlight feature. These travel trailers have a reputation for being a good value for their price-point. Minor repairs throughout are expected, as with everything. The quality is good, so it is dependable enough. As you can tell by both the name and the weight range, these are the trailers of choice if you don’t have a strong tow vehicle. Their compact floor plans are great for vacationing on a budget. Inconsistent quality is a pretty big problem. Some reviews are shining and others are not. Looking through reviews and forums, customer service does not appear to be great. Multiple owners have reported having difficulty getting through to the company and some say that the calls are never returned. There are two versions the Voltage Line. There is the Voltage line and then there is the Voltage Epic line. Both of them offer the bunk bed feature, but we are just going to focus on the Basic Voltage line for today. The more I look into Dutchmen, the more I like them. Out of the many manufacturers that I have researched (50+), they are one of the most consistently praised by their patrons. I’m not getting paid to say that; It is just what I have noticed. Considered to be medium-level quality trailer with a relatively pleased customer base. It is lightweight, so there will be a drop in overall durability. The most prolific issues seem to be with the roof, so do a thorough inspection of the ceiling before purchasing if this line of trailers interest you. The 320BHDS has been noted to have a “design flaw” that ruins the floors with water when driving through hard rain. It appears to be an issue with that specific model, so be aware of that. The year was unspecified. Coachmen was purchased by Forest River in 2008, and some have expressed concern about a potential drop in dependability. However, the quality hasn’t appeared to be negatively affected, and overall, they seem to be maintaining a level of quality that is competitively consistent. Forest River is a budget class RV, so I’m not going to lie and say that everything is fantastic. The sealant will need to be replaced, screws are going to pop out, and parts will eventually fall into disrepair. You should do your research, so that you know what you should expect from an RV within this price range. After accepting that these lower-priced RVs are going to be problematic, you will know whether or not you should pay for something a bit higher up on the RV food chain. Sooo, why am I recommending it? Honestly, it isn’t a horrible starting point. If you aren’t ready to buy a mid-to-high range RV, then this is a good early step. It will serve you provided that you are also ready to serve it with a little elbow grease and a little more know-how. Built on a budget; the Shadow Cruiser isn’t a top of the line class. It is, however, a way for families to get into the camper life without breaking the bank. These are some of the best selling RVs on the market because they make the first steps of this RV adventure a little bit easier. 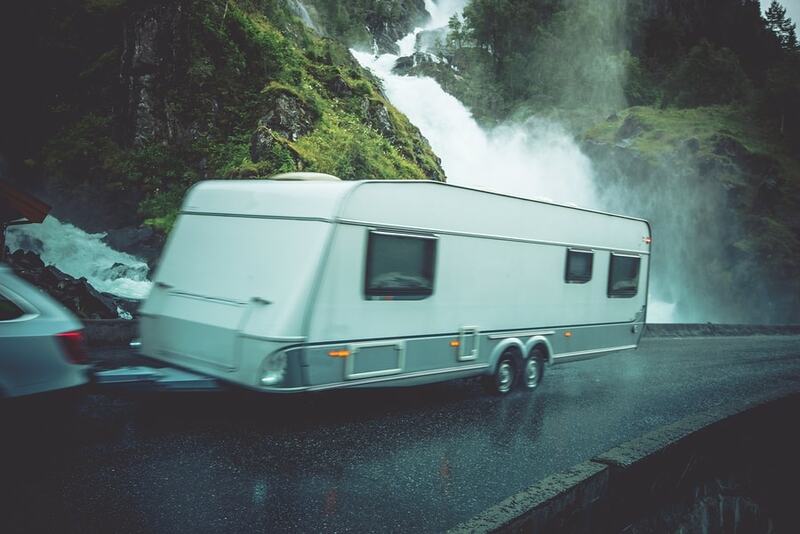 If you are prepared to take on the responsibilities of RV ownership…and that means making the occasional repair that budget RVs inherently present, then this might be an RV line worth considering. Buying a new travel trailer is a big purchase and I along with others recommend looking around for a year before your purchase since it gives you time to see all the models on the market as well as for the new models to gather up some reviews. An easy option in the meantime is to simply pack a set of bunk beds in your current trailer. This bunk bed from Kid-O-Bunk on Amazon is a nice alternative that may work nicely for you until you are ready to make the big purchase. There are a lot of trailers to choose from when deciding on the best bunkhouse trailer for your family and there are still more to choose from that we did not include on our list. I recommend this list as merely a starting point. Not every trailer that is good for one family is good for another. Features vary widely and it’s important you take your time to choose the right one for your family. Explore the options available and see what works for you.